I’d like to do away with Easter all together in our house hold, but I probably won’t for the kids sake. 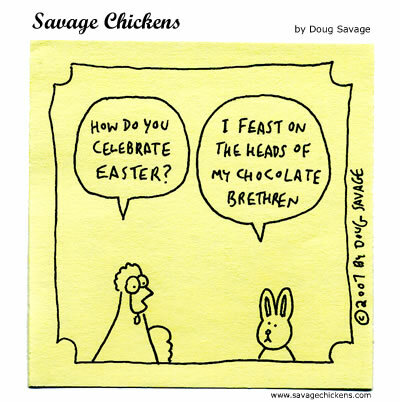 My whole family, strangely, stopped celebrating Easter together 5 or 6 years ago. Mainly when my grandma got up in age and couldn’t handle cooking a huge meal for everyone. No one else picked up the task, so we just stopped doing it all together. So, my kids have never experienced a Christian Easter, one where all your cousins get together and hunt colored eggs in your Sunday best, after you go to church. The Easters they have experienced have always been here at home, with just us. In the morning they get up and find an Easter basket full of junk. I say junk, because that’s really all it ever is. Stuff they are going to immediately lose interest in and then I’m going to pick it up off the floor and put it in the giveaway pile. They have never boiled eggs and colored them. I’ve always just gotten plastic eggs and filled them with more junk(candy, coins, small toys). 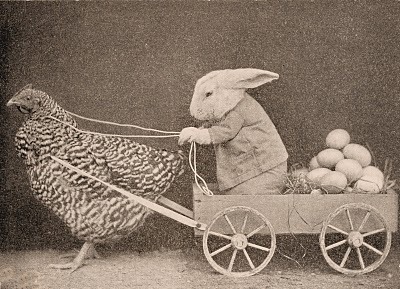 They don’t even know why most people celebrate Easter. I take that back, they asked last year, but I don’t think they remember that. Of course, when they were really young I told them why it was celebrated, I was Christian then, and I know they don’t remember that. So, it’s really not that big of a deal for them. However, since I’ve done it since they were born and they like candy, and to hunt the plastic eggs, they would miss it, so I do it year after year. Kinda tired of it. Maybe I should get some Easter candy and I’d enjoy it more? What are your thoughts on Easter? Do you celebrate it and if so what does it mean to you? This entry was posted in About Me, Agnostic, Atheist, Children, Christian, Family, Holiday, Parenting and tagged children, Easter, Easter as a unbeliever. Bookmark the permalink. I don’t have children, it’s just me, my husband, and our cats. We do see my family on Easter and have a nice dinner and my mom gives us candy (along with my siblings). I view Easter as being the same as Christmas. Not in the Christian sense, however. I view Easter as the coming of Spring, a way to spend time with family, and eat some yummy food and candy. I view Christmas as a time of reflection on the year, spend time with family, and eat some yummy food and candy. Holidays breaks up the monotony of life, gives us something to look forward to if we’d like. Well, for the first time in years I’m having easter dinner- because the senior apartments my parents live in apparently become a zoo on easter sunday and they want to escape. They’re meeting my bf’s dad for the first time, too, but this will (hopefully) be completely non-religious- just a nice family dinner. I don’t have kids, so normally I do nothing on Easter sunday! I agree with Junkies; I celebrate Easter as the coming of spring. When my children were young, we’d go to Easter egg hunts and have a family meal, but there wasn’t anything religious about our celebration. I never saw any reason to forbid my children to celebrate in a religious way, though, and sometimes they went to church with their friends, which they also did on Christmas. I say buy some Easter candy, cook a big meal and find a reason to celebrate! Yeah, as a kid and young adult I enjoyed Easter and Christmas without ever thinking of it as “religious.” I’m not sure why I was immune to the religious aspect. As an adult in my fifties I dread both holidays because where I live they are steeped in religion. I find it very depressing. I have to say, this year at least I really found it just another unwelcome intrusion into a schedule that was already far too full. ::sigh:: The kids had fun, but even with the Beautiful Woman giving me a chance to sleep in, I wound up exhausted and resentful.